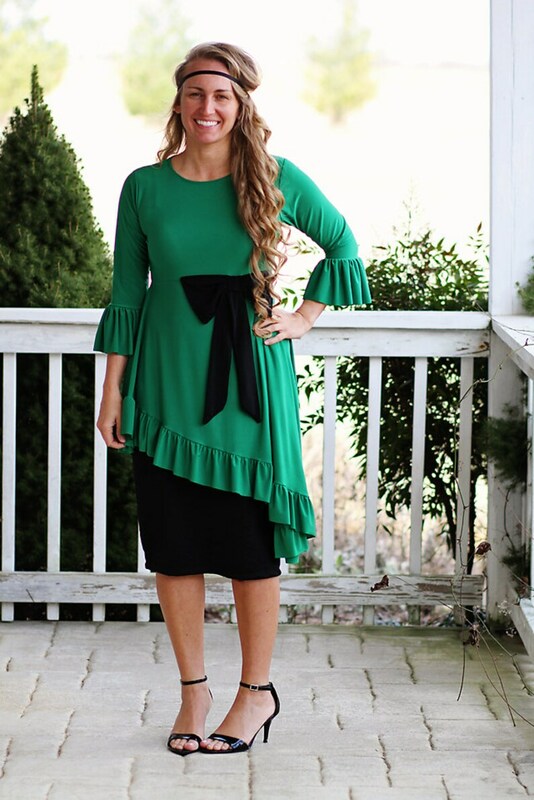 This peplum shirt features a long tail on one side, ruffled sleeves and hem and a bow! Super comfy knit. Please check the measurements and order accordingly. All fabric options are knit. All seams are serged. PLEASE NOTE: THE HOUNDSTOOTH PRINT IS NO LONGER AVAILABLE AT THIS TIME. IT CAN BE ORDERED IN SOLID COLORS AND A COUPLE OF PRINTS. PICTURES ARE FOR STYLE REFERENCE ONLY. XSMALL: BUST: 34" LENGTH: 30" FROM SHOULDER TO BACK HEM. LONG SLEEVE: 24" 3/4TH: 15"
SMALL: BUST: 36" LENGTH: 30" FROM SHOULDER TO BACK HEM. LONG SLEEVE: 24" 3/4TH: 15"
MEDIUM: BUST: 38" LENGTH: 30" FROM SHOULDER TO BACK HEM. LONG SLEEVE: 24" 3/4TH: 15"
LARGE: BUST: 41" LENGTH: 30" FROM SHOULDER TO BACK HEM. LONG SLEEVE: 24" 3/4TH: 15"
XLARGE: BUST: 43" LENGTH: 30" FROM SHOULDER TO BACK HEM. LONG SLEEVE: 24" 3/4TH: 15"
2XLARGE: BUST: 46" LENGTH: 30" FROM SHOULDER TO BACK HEM. LONG SLEEVE: 24" 3/4TH: 15"
So many compliments. Absolutely love your tops. They’re just perfect 👌 thank you so much! God Bless you.